Constructivist architecture was a form of modern architecture that flourished in the Soviet Union in the 1920s and early 1930s. It combined advanced technology and engineering of the era with an avowedly Communist social purpose. A central aim of Constructivist architects was to instill the avant-garde in everyday life. Constructivism was literally about constructing the spaces in which the new socialist utopia could be achieved. This led to the creation of utilitarian projects for the workers, as well as outlandish projects like Gyorgy Krutikov’s Flying City, an ASNOVA project that was intended as a serious proposal for airborne housing. These extremes demonstrate the tensions between individualism and utilitarianism in Constructivism, which on the one hand helped promote the greater equalization of society and on the other offered some grandiose, even foolhardy projects. The first and most famous Constructivist architectural project was the 1919 proposal for the headquarters of the Communist International in St Petersburg by the Futurist, Vladimir Tatlin, often called Tatlin's Tower. Though it remained unbuilt, the materials—glass and steel—and its futuristic ethos and political slant (the movements of its internal volumes were meant to symbolize revolution and the Marxist dialectic) set the tone for the projects of the 1920s. Another famous early Constructivist project was the Lenin Tribune by El Lissitzky (1920), a moving speaker's podium. 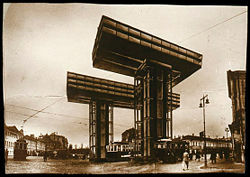 During the Russian Civil War, the UNOVIS group centered around Malevich and Lissitzky, designing various projects that forced together the "non-objective" abstraction of Suprematism with more utilitarian aims, creating ideal Constructivist cities (see also El Lissitzky's Prounen-Raum or the "Dynamic City" (1919) of Gustav Klutsis). 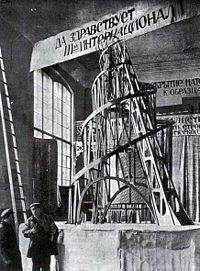 In this and Tatlin's work the components of Constructivism could be seen as an adaptation of various high-tech Western forms, such as the engineering feats of Gustave Eiffel and New York City's or Chicago's skyscrapers, for a new collective society. After the Russian Civil War, the Soviet Union was too poor for any new building projects. Nonetheless, the Soviet avant-garde school of constructivist art, VkHUTMAS, started an architectural wing in 1921, which was led by the architect Nikolai Ladovsky. The teaching methods were both functional and fantastic, reflecting an interest in gestalt psychology, leading to daring experiments with form such as Simbirchev's glass-clad suspended restaurant. Among the architects affiliated to the ASNOVA group (Association of New Architects) were El Lissitzky, Konstantin Melnikov, Vladimir Krinsky, and Berthold Lubetkin. Projects from 1923-1925, like Lissitzky and Mart Stam’s Wolkenbügel horizontal skyscrapers and Konstantin Melnikov’s temporary pavilions showed the originality and ambition of this new group. Melnikov would design the Soviet Pavilion at the Paris Exposition of Decorative Arts of 1925, which popularized the new style, with its rooms designed by Alexander Rodchenko and its jagged, mechanical form. Another glimpse of a Constructivist living environment can be found in the popular science fiction film "Aelita," which had interiors and exteriors modeled in angular, geometric fashion by Aleksandra Ekster. The state-run Mosselprom department store of 1924, was also an early modernist building for the new consumerism of the New Economic Policy, as was the Vesnin brothers' Mostorg store, built three years later. 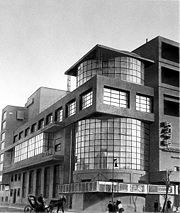 Modern offices for the mass media were also popular, such as the Isvestia headquarters, the Soviet news agency, built by A. Gegello in 1925..
A colder and more technological Constructivist style was introduced by the 1924 glass office project by the Vesnin brothers for Leningradskaya Pravda (Leningrad Pravda, the newspaper of the Communist Party). In 1925, a separate group, also with ties to Vkhutemas, was founded by Alexander Vesnin and Moisei Ginzburg- the OSA or Organization of Contemporary Architects. This group had much in common with Weimar Germany’s Functionalism, such as the housing projects of Ernst May. Housing was the main priority of this group, especially collective housing in specially designed dom kommuny (communal homes) to replace the collectivized nineteenth century housing that had been the norm. Collective housing projects that were built included Ivan Nikolaev’s Communal House for students (Ordzhonikidze St, Moscow, 1930), and Ginzburg’s Moscow Gostrakh and Narkomfin apartment buildings Flats were built in a Constructivist idiom in Kharkiv, Moscow, and Leningrad. Ginzburg also designed a government building in Alma-Ata, while the Vesnin brothers designed a School of Film Actors in Moscow. Ginzburg critiqued the idea of building housing in the new society that would be the same as in the old: "Treating workers' housing in the same way as they would bourgeois apartments…the Constructivists however approach the same problem with maximum consideration for those shifts and changes in our everyday life…our goal is the collaboration with the proletariat in creating a new way of life." OSA published a magazine, SA, or Contemporary Architecture, from 1926 to 1930. The leading rationalist, Ladovsky, designed his own, rather different kind of mass housing, completing a Moscow apartment block in 1929. A particularly extravagant example is the "Chekists Village" in Sverdlovsk (now Yekaterinburg), a hammer and sickle shaped collective housing complex for members of the secret police, which currently serves as a hotel. The new forms of the Constructivists began to symbolize the project for a new everyday life of the Soviet Union, then in the mixed economy of the New Economic Policy. State buildings were constructed, like the huge Gosprom complex in Kharkiv (designed by Serafimov, Folger, and Kravets, 1926-8), which was regarded by Reyner Banham in his Theory and Design in the First Machine Age as being, along with the Dessau Bauhaus, the greatest modernist work of the 1920s. 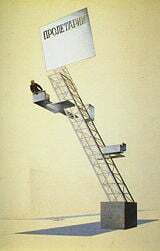 Other notable works included the aluminum parabola and glazed staircase of Mikhail Barsch and Mikhail Sinyavsky’s 1929 Moscow Planetarium. Traditionalist architects adopted Constructivism, such as Ivan Zholtovsky in his 1926 power station or Alexey Shchusev’s Lenin Mausoleum and Narkomzem offices, both in Moscow. 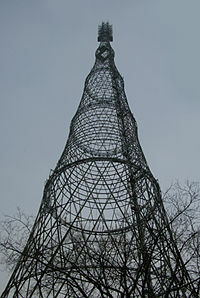 Similarly, the Shukhov Tower, named for its engineer Vladimir Shukhov, was often seen as an avant-garde work and was praised by Walter Benjamin in his Moscow Diary. 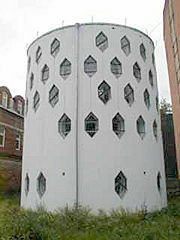 Shukhov also collaborated with Melnikov on the Bakhmetevsky Bus Garage. Many of these buildings are shown in Sergei Eisenstein’s film, The General Line, which also featured a specially built mock-up Constructivist collective farm, designed by Andrey Burov. A central aim of the Constructivists was to instill the avant-garde in everyday life. From 1927, they worked on projects for Workers’ Clubs, communal leisure facilities usually built in factory districts. Among the most famous of these are the Rusakov Workers' Club, designed by Konstantin Melnikov, the club of the Likachev works created by the Vesnin brothers, and Ilya Golosov’s Zuev Workers' Club. 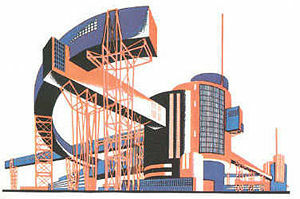 At the same time as this foray into the everyday, outlandish projects were designed such as Ivan Leonidov’s Lenin Institute, a high tech work that bears comparison with Buckminster Fuller, which consisted of a skyscraper-sized library, a planetarium and dome, all linked together by a monorail; or Gyorgy Krutikov’s self-explanatory Flying City, an ASNOVA project that was intended as a serious proposal for airborne housing. Melnikov House and his Bakhmetevsky Bus Garage are fine examples of the tensions between individualism and utilitarianism in Constructivism. There were also projects for Suprematist skyscrapers called "planits" or "architektons" by Kazimir Malevich and Nikolai Suetin. Yakov Chernikhov produced several books of experimental designs, most famously, Architectural Fantasies (1933), earning him the epithet "the Soviet Piranesi." Many of the Constructivists hoped to see their ambitions realized during the Cultural Revolution that accompanied the first Five Year Plan. At this point the Constructivists were divided between urbanists and disurbanists who favored a garden city model. Their projects for new cities, such as Magnitogorsk, were often rejected in favor of the more pragmatic German architects fleeing Nazism, like Ernst May, Hannes Meyer, Mart Stam, Margarete Schütte-Lihotzky, and Bruno Taut. The city-planning of Le Corbusier found brief favor, with the architect writing a "reply to Moscow" that later became the Ville Radieuse plan, and designing the Tsentrosoyuz (Central Soviet) government building with the Constructivist Nikolai Kolli. The duplex apartments and collective facilities of the OSA group were a major influence on his later work. Another famous modernist, Erich Mendelsohn, designed a factory that was built in Leningrad, and popularized Constructivism in his book, Russland, Europa, Amerika. A Five Year Plan project with major Constructivist input was DnieproGES, designed by Victor Vesnin. El Lissitzky also popularized the style abroad with his 1930 book, The Reconstruction of Architecture in Russia. The 1932 competition for the Palace of the Soviets, a grandiose project to rival the Empire State Building, featured entries from all the major Constructivists as well as Walter Gropius, Erich Mendelsohn and Le Corbusier. However, this coincided with the rise of Stalinism and its widespread criticism of modernism across the arts. The Soviet Union was still primarily a mostly rural, agrarian country composed of 90 percent peasants. There was also the critique that the style merely copied the forms of technology while using fairly routine construction methods. The winning entry by Boris Iofan marked the start of the eclectic historicism of Stalinist Architecture, a style which bears similarities to Post-Modernism in that it reacted against modernist architecture's cosmopolitanism, alleged ugliness and inhumanity with a pick and mix of historical styles, usually achieved with new technology. During the heady, revolutionary day of the 20s, collectivization of facilities, equality of the sexes and collective raising of children were seen as the wave of the future. Housing projects like the Narkomfin were designed for the attempts to reform everyday life during that period, but they fell out of favor as the hearth was revived under Stalinism, and women were back in the kitchen. The styles of the old world were revived, with the Moscow Metro in particular popularizing the idea of "workers' palaces." Still, at the end of the 1920s, Constructivism was the country's dominant architecture, and surprisingly many buildings of this period survive, despite the return to a Classicism that was initially inflected with Constructivist devices, such as in Iofan's Moscow housing projects of 1929-32. The Stalinist reaction was totally dominant until the late 1950s. 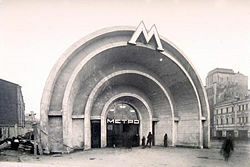 A few isolated projects begun in the early 30s, such as Porteleimon Golosov’s Pravda building or Ladovsky’s rationalist vestibules for the Moscow Metro were built in the new climate. Competition entries were made by the Vesnin brothers and Ivan Leonidov for the Commisariat for Heavy Industry in Red Square, 1934, another unbuilt Stalinist edifice. 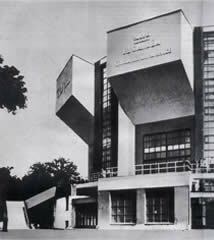 Traces of Constructivism can also be found in some Socialist Realist works, such as the Futurist elevations of Iofan’s ultra-Stalinist 1937 Paris Pavilion, which had Suprematist interiors by Suetin. Due in part to its political commitment and its ultimate replacement by Socialist Realism, the mechanistic, dynamic forms of Constructivism were not part of the calm Platonism of the International Style as it was defined by Philip Johnson and Henry Russell Hitchcock. Their book included only one building from the Soviet Union, an electrical laboratory by Nikolaev. Constructivism has often been seen as an alternative, more radical modernism, and its legacy can be seen in designers as diverse as Team 10, Archigram, and Kenzo Tange, as well as in much Brutalist work. Their integration of the avant-garde and everyday life has parallels with the Situationists, particularly the New Babylon project of Guy Debord and Constant Nieuwenhuys. High-tech architecture also owes much to Constructivism, most obviously in Richard Rogers’ Lloyd's building. Zaha Hadid's early projects were adaptations of Malevich's Architektons, and the influence of Chernikhov is clear on her drawings. Unfortunately, many of the original Constructivist buildings are poorly preserved or in danger of collapse. Melnikov House near Arbat Street in Moscow. ↑ 1.0 1.1 S.N Khan-Magomedov, Pioneers of Soviet Architecture (1988). ↑ Arts Council of Great Britain, Art in Revolution: Soviet Art and Design Since 1917 (London: Arts Council of Great Britain, 1971). ↑ V. Buchli, An Archeology of Socialism. ↑ Reyner Banham, Theory and Design in the First Machine Age. Cooke, Catherine. The Avant Garde. AD magazine, 1988. Cooke, Catherine. Fantasy and Construction—Iakov Chernikhov. AD magazine, vol 59 no 7-8. Lissitzky, El. The Reconstruction of Architecture in the Soviet Union. Vienna, 1930. Constructivist buildings under threat at Moscow Architectural Preservation Society. Guardian article on preserving Constructivist buildings. This page was last modified on 21 March 2017, at 19:02.